This entry is a guest post from my dear friend Christina Arteaga. She is a wife, a mom, a creative (in every sense of the word) and someone who is unashamedly after the Lord’s heart. It’s my pleasure to share this post with you! You can read more of her stuff on her blog. Nobody likes to hear the “C” word. Every time it gets brought up in a discussion, especially one where advice is being issued, it’s like a knife in our ears and a punch to our hearts. How can people even say that word so easily? It carries such a stigma. And yet, I’ve learned that contentment is the key. If you’re struggling today, let me instruct you on tangible ways to be content. I feel Andy Mineo said it best in his song “Curious” off of his “Heroes for Sale” album. In it, he says “The secret is to learn what it means to be content and celebrate what God’s given [and] not the things He didn’t.” This seems like a pretty elementary idea, but putting it into practice can be a bit harder than it seems. This can be explained in two parts: (a) Praise God for the things He’s already given you and (b) celebrate those things, but don’t worship them. Praise God for what you’ve already received. It’s always easy to have a “grass is always greener on the other side” mentality, but what we don’t realize it there are people looking into our own lives thinking “I wish I had ________ like they do”. I’m married. I know plenty of single people looking for their future spouse. I have a daughter. There are people trying to have kids and devastated that they can’t. I have a roof over my head, a vehicle to drive to work, a job to pay my bills, a pretty decent phone…the list goes on and on. Instead of focusing on what God has yet to give you, praise Him for the things He has already gifted you with. And in that, don’t worship the gift. A good thing can quickly become an idol when you make that thing your source of happiness instead of Jesus. Everything fails you. A perfect husband could forget your anniversary. The greatest car could have a flat tire. When we put so much on a human or an item, our joy is shattered when the inevitable happens and it fails us. Contentment means being grateful for the gift, but placing your joy in the GIVER and never moving it from there. Remember when I mentioned that a perfect husband could forget your anniversary and the greatest car could have a flat tire? The truth is there is no such thing as a “perfect” husband or a “greatest” car because “perfect” and “greatest” are subjective. To me, the “greatest” car is one that saves me gas money. To someone else, it might be a red car (personally, I prefer black cars). My husband really loves sports. I like that about him. Maybe to another woman, that would be a turn-off. When we go on a search for the perfect _______ or the greatest ______, we go on a never-ending search because, at the end of the day, we must realize that it simply doesn’t exist. The plain truth is that our focus shouldn’t be on what God didn’t give us. 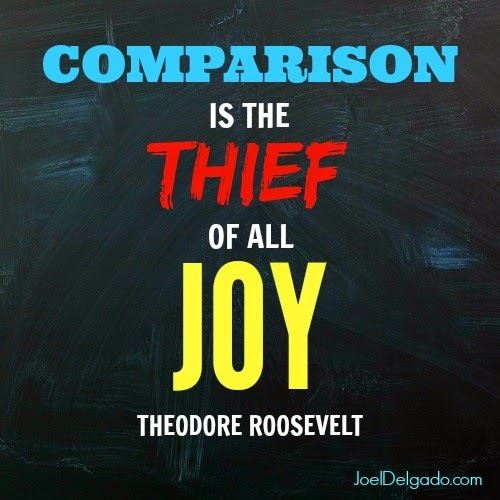 Theodore Roosevelt once said “Comparison is the thief of all joy” and he is correct. When your focus is on what you don’t have, you are inevitably comparing what you do have to what others have, which leads to feelings of envy, greed, jealousy, anger, bitterness and more. Don’t be ashamed if you find yourself struggling with this. Personally, all of 2014 was a struggle with contentment for me. I wasn’t alone and neither are you. You can overcome this. There is a light at the end of this dark and cold tunnel. Contentment isn’t just another “Chrsitianese” word. It is something real and something attainable. 1) Pray and ask God to show you where you aren’t content. Sometimes we don’t even realize we’re envying or we’re bitter. 2) Make a list of the things you are thankful for and praise God for those things individually. There is something good in everything, even if we don’t see it at first. 3) Realize that the things we dream about, even the noblest of things, aren’t perfect and never will be. There is no perfect husband, perfect home, perfect job, etc. Letting go of this false reality is the first step to becoming content. 4) Understand that God can give you what you dream of, believe that God will, but know that even if He doesn’t, He is still God and His promises are still true. Contentment is a real thing. It is the key that unlocks the door to joy in Christ. It is a game changer. You can follow Christina on Twitter at @TinaXArte and see more of her blog posts at ChristinaXArtega.com.